My skin and I have had a turbulent time together. At the age of eight, I remember vividly my Mum sitting me down one Saturday morning to explain she''d noticed I'd begun to develop blackheads and small blemishes. Cue terrorised tears! She would then help me with a three step Dermalogica skincare regime, morning and night, in a bid to help keep my skin clear. Then throughout the rest of my tween/teen years until the age of 16 or so, I would dip in and out of some form of a skin care regime. All the while I had a pretty poor diet - cookies, chocolate, cakes, you name it. Anything sweet and particularly, chocolate-y, I would be all over. Little did I know what a terrible effect all of that sugar would be having upon my skin. Now, all of this combined with PCOS was just a match made in the hormone devil's heaven. Fortunately for the past five years I've maintained a solid skin care regime, morning and night. My top tip for anyone, however, who wants to clear up their skin is to evaluate your diet. Sugar is a huge aggravator towards my oily, hormonal, acne prone skin but usually only when had in slightly excessive quantities. My diet is mainly very healthy - lots of green vegetables, oily fish, water is all I drink, nuts, avocados, berries, you name it. Now this little skin saving recipe may seem an oxymoron to any of you skincare experts or healthy eating advocates. Dates are seriously high in sugar, albeit natural. Per 100g of dates contains approximately 68g of sugar. Now, I'm planing a post all about fruit and natural sugars that will be popping up on your Bloglovin'/Twitter feed in the coming days, but at the end of the day, sugar is sugar. It can be released slowly, it can be low GI, it can contain more nutrients than white caster sugar. But at the end of the day, if your body doesn't use it, your body is going to metabolise it and use it in the exact same way. Nonetheless, what's life without a treat now and then and it's pretty much impossible to avoid sugar, particularly natural sugars, everyday. I've rustled up these cookie like 'bites' that can be enjoyed as a pre/post workout boost, a mid-afternoon snack or simply a tasty treat. They contain Vitamin E packed almonds which help to keep your skin protected and acts as a barrier from nasties. 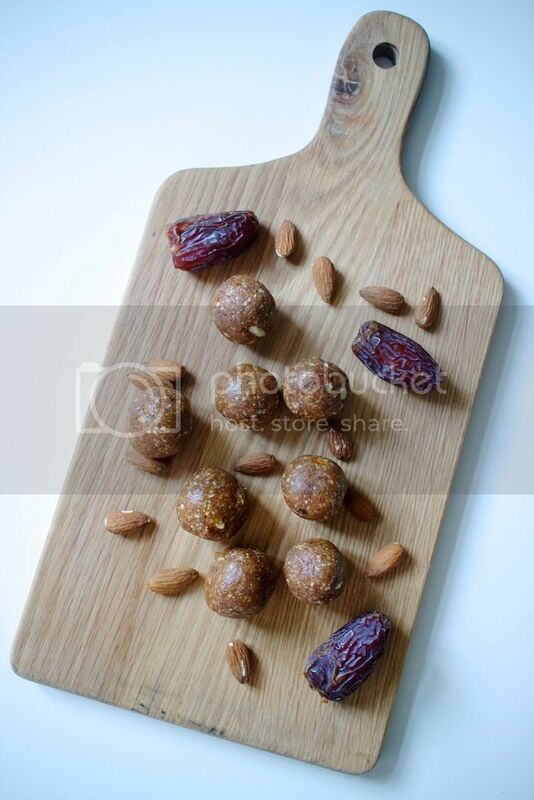 The oily nature of nuts also encourages the skin to remain plump and youthful looking. Cinnamon aims to reduce blemishes and acts as a complexion enhancer too, so combined with the almonds means gorgeous, glowing skin. I actually made these with my Nutribullet, for anyone who may be stuck for ideas with what to do with your magic machine. My top tip os to soak the dates in a bowl of warm water for half an hour or so, drain and then roughly chop the dates. I used the regular extractor blade for a more textured, chunkier mixture but if you want a finer texture, use the milling blade which will basically make ground almonds. Blitz it for about five seconds and pause when binding the mixture, just to stop it from overheating! 1. Soak your dates in a bowl of warm water for approximately 30 minutes, or until they've softened. Drain, pit and then roughly chop. 2. Add your almonds to a food processor or Nutribullet and blitz until it creates either a chunky/crumbly texture or a finer, 'flour' like texture, depending on your preferences. 4. Once combined, with a spoon or your hands, take the mixture between your palms and roll into balls. Chill in the fridge until they've firmed up. Et voila! Let me know if you make these scrummy little balls of goodness! Tweet me or send me a picture on Instagram. Do you have any 'Skin Saving' recipes or ingredients of choice? What are your current favourite skin care products? Does your skin react badly to sugar? These are so simple and easy to make, but look delicious. I love making snacks like this to tide me over during the week. The great thing is that they keep pretty well, so you can pop them in a tiny tupperware tub and in your bag for a quick pick me up when out and about. Yes I struggled with keeping things exciting with my NutriBullet for a while too - there's only so many green smoothies you can make! Dairy aggravates my skin too, though if it's organic (how fancy) I find it doesn't have such a bad effect. I think I'm slightly more sugar sensitive/sugar really affects my hormones which are already a bit mental!